1853, 5¢ blue, thick white paper, neat face-free San Francisco town cancel, large well balanced margins, deep color on bright paper, Extremely Fine; with 2014 P.S.E. Graded certificate (XF 90). 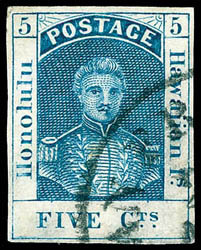 AN EXCEPTIONAL USED EXAMPLE OF THE 1853 5¢ KAMEHAMEHA THICK PAPER ISSUE. 1899, 2¢ rose, "flying goose" flaw, blue "A.B.N.Co." Specimen overprint, small serif letters, with large security punch hole, bottom margin single with part imprint, o.g., never hinged, brilliant color and exceptional freshness, Fine and rare, a Remarkable 1899 2¢ Rose Specimen Bearing the "Flying Goose" Plate Flaw; with 2015 P.F. certificate. Scott No. 81 Estimate $750 - 1,000. 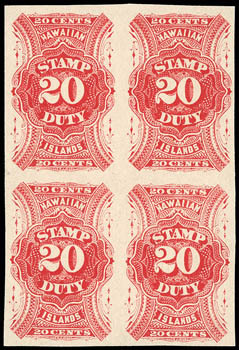 Revenue, 1894, 20¢ red, imperf, block of 4, o.g., never hinged, ample to large margins, rich radiant color on fresh pristine paper, Very Fine and choice; with 2011 P.F. certificate. Scott No. R9a $5,400 for pairs. 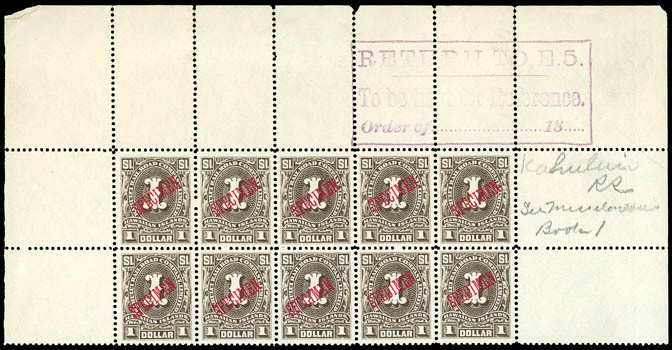 A VERY RARE NEVER HINGED EXAMPLE OF THE 1894 20¢ "STAMP DUTY" IMPERFORATE ISSUE IN BLOCK FORMAT. 1894, 5¢-$1 Kahului Railroad complete, red A.B.N.Co. 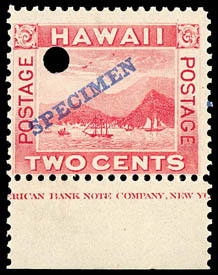 "Specimen" overprint, full sheet margin blocks of 10, o.g., never hinged, complete matching set each with large purple reference handstamp top right portion of selvage, 6¢ issue with position 2 missing the "Specimen" overprint, some perf separations and minor selvage faults, still a Very Fine set, ex Pietsch; each signed and plated A. Chang. Meyer-Harris No. 151S-156S Estimate $10,000 - 15,000. A WONDERFUL AND UNIQUE SPECIMEN EXHIBITION SET OF THE AMERICAN BANKNOTE COMPANY KAHULUI RAILROAD ISSUE.